Abby has super good genetics behind her and it shows in her udder. She kidded quads in 2011 and triplets in 2012 and 2013 and twins in 2014. . All of her kids are spoken for this year. 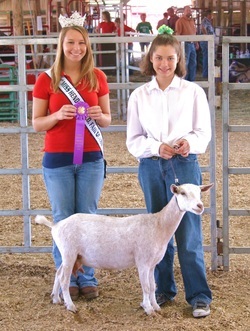 They are showing her length of body and width and great width between the hocks and stand on good legs. Abby is by far our best milker and is able to produce enough milk for her kids and for us.